Middle-clicking or Ctrl-right-clicking a channel header opens the new quick channel settings dialog, which can be used to quickly adjust volume, panning and channel names. Improved support for AIFF samples (loop points, up to 32-Bit PCM and floating point audio as well as little-endian PCM samples) and WAV samples with arbitrary bit resolutions up to 32-Bit (e.g. 20-Bit). Effect plugins are now sorted into plugin categories (as reported by the plugins) in the plugin selection dialog. Delete the plugin.cache file in OpenMPT's settings directory to rebuild the plugin cache with categories. Loading a plugin into a module will also update the cache. The current playback position is now also reported correctly to plugins when jumping around in the order list. Previously, it was always reset to the song start. 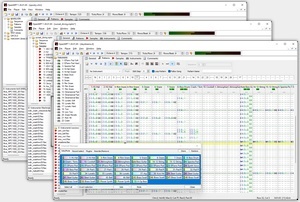 This enhances support for sequencer plugins like Maschine. The Korg Wavestation GUI did not work until song was played for the first time since OpenMPT 1.20. This may also fix the GUI of older versions of the Korg M1 plugin. Suport for AMS (Velvet Studio) modules is finally back (not crashing the tracker this time :). AMS (Extreme's Tracker) support has been improved as well. The WAV Loader also imports loop points when reading a WAV file as a module. Improved support for S3M, STM, UMX, MDL and MED modules. In the Keyboard Settings dialog, shortcuts can now also be found by pressing the sought-after key combination. Song Length Estimation also takes per-pattern time signatures into account now. F1 was accidentally hardcoded to opening the help file. Fixed some small issues with the MIDI Input / Output plugin. In other news, Inno Setup, the tool that is used to create the OpenMPT installer, has dropped support for Windows 9x in its latest version. The OpenMPT 1.20 installer is still compiled with an older version (and thus with Windows 9x support), but future versions will probably use the lastest version of Inno Setup. How important is Windows 9x support for you? Please post a comment and tell us your opinion! Windows 9x is dated enough that an installer won't matter. As long as the zip file still works, that should be enough. I see there still is no 'find only in pattern range' that has been in the feature requests with a lot of hits for God knows how long!!! don't you guys EVER listen to us??? You're not the only person using OpenMPT and suggesting features (hint: there are currently more than 100 unassigned feature requests and bug reports). My time for working on OpenMPT is limited and I can only implement a limited amount of features, fix bugs or whatever in my spare time (I have a life too, you know). Mind you, there are even older feature requests by myself that I don't have time for. I prioritise to those requests that I am most interested in or that sound very useful to have. So yes, I listen to the people on the issue tracker, but I cannot fulfill everyone's wishes. And I don't see you how can so surprised about this anyway - this particular feature request's status is still "unassigned" on the issue tracker, meaning that noone has considered implementing it yet. The status will remain "unassigned" until someone implements it, and until this happens, you don't have to wonder why it hasn't been implemented yet. If this feature is so extremely important to you, consider learning C++ and implement it for yourself. Don't know if this caused because i'm using windows 7 or vst plugin without gui (mda tracker/dynamics). But entering a plugin and pressing [Randomize parameters] does nothing. I put the the portamento on the first note, let it continue across the pattern, and no sound. Ive checked hacks, Ive checked if I did anything wrong. It has worked before, I have tried it on 5 different computers.. When I remove the effect, it workes fine. There are many possibilities why you wouldn't hear a note in this example (volume envelopes, sample default / global volume, etc...), so it would probably be best if you just sign up on the forums and post the module in question there. Actually thinking of it, you are probably working at 1 tick per row, which previously (in OpenMPT 1.17-1.19) allowed normal portamentos to work, however at speed 1 only fine and extra-fine slides are supposed to work. ModPlug Tracker 1.16 did this correctly so I removed that "fix" that actually introduced wrong behaviour.